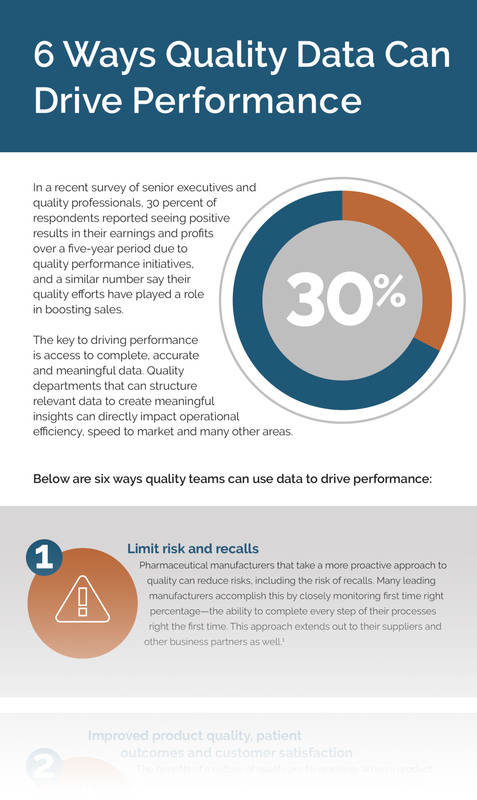 Increasing access to meaningful data is quickly changing how Pharma executives view their quality departments. In a recent survey of senior executives and quality professionals, 30 percent of respondents reported seeing positive results in their earnings and profits over a five-year period due to quality performance initiatives, and a similar number say their quality efforts have played a role in boosting sales. Quality teams are quickly shifting their focus from compliance to performance—driving product quality, reducing risk, increasing margins, and more. If these benefits weren’t compelling enough, even compliance goals are evolving as regulators place increased pressure on pharma manufactures to improve over quality of their operations. (Read the first paper in this series, How Evolving Regulatory Pressure Will Impact Emerging Life Science Companies, for detailed insights on current and emerging regulations focused on improving quality in the life sciences industry).